Thomas Frederick Burnaby Atkins (d. 1918) and presumably sold with the rest of his estate following the death of his wife in 1920. Mrs. Gladys Doble in lieu of a debt, and by descent to her grand-daughters. 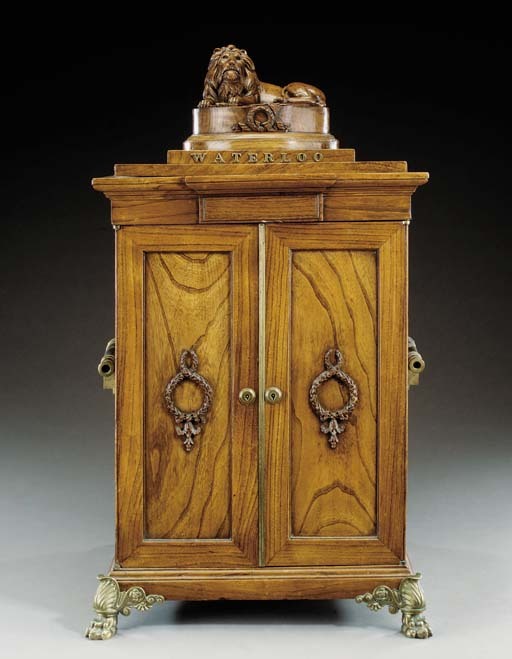 This cabinet's celebrated timber formed part of the ancient Waterloo elm tree that became a reveered emblem of 'Liberty', following its service as the principle command post of Arthur Wellesley, 1st Duke of Wellington during much of the day of the 18 June 1815, when he defeated Napoleon at the Battle of Waterloo in Belgium. The tree became a target of souvenir hunters, and as its truncated remains were being felled by its owner in September 1818 they were purchased by John George Children, a Fellow of the Society of Antiquaries and librarian in the British Museum's Department of Antiquities. The elm, which featured in an 1816 aquatint of Mount St. Jean published by A. Bowyer, was later to cause the artist Benjamin Haydon to write of an 'English disease' that was recognised from 'Petersburgh to Lisbon', when he complained 'You can't admit the English into your gardens, but they will strip your trees, cut their names on your statues, eat your fruit, & stuff their pockets with bits for their museums'. As the British armies fought in the name of George, Prince Regent, later George IV, the Marquess of Wellesley, brother of the Duke of Wellington, proposed the inscription Gregorio Augusto Euorpae Liberatori' ('To George Augustus the Liberator of Europe') for a throne that was made from the Waterloo elm and commissioned at the time of George IV's accession in 1820. The throne, which incorporated a tablet inspired by T. Sutherland's 1816 engraving View of the Village of Waterloo, The day after the Battle, June 19th 1815, was designed and executed under Children's direction by Thomas Chippendale Junior (d. l822), Upholsterer and Cabinet-maker to the Duke of Gloucester', and was delivered on 24 February 1821 to Carlton House, London (now shown in the Queen's Guard Room in Windsor Castle). Mr. Children had another 'Waterloo elm' chair executed for his own use by Chippendale, and later presented to the Duke of Wellington in l837. He also had made a 'Cabinet for minerals' and a work-table for his daughter Anna Atkins (d. 1873), who had accompanied him on his visit to Waterloo and had sketched the elm before it was felled. This was amongst the elm souvenirs recorded at her home Halstead Place, Kent in her Memoir of J.G. Children, which was published in 1853. Amongst other items executed from elm fragments that Children presented to friends, was an armchair commissioned by the Duke of Rutland and which is now at Belvoir Castle, Rutland (C. Fox, London-World City, London, l992, no. 302 and G. de Bellaigue, 'The Waterloo Elm', Furniture History, l978, pp. 14-18). A second Waterloo elm cabinet, acquired at a house sale in Kent in the 1920s (presumably Halstead Place) was sold anonymously, Phillips Edinburgh, 28 March 1997, lot 237 (£22,000).